When you spend your life working in a restaurant and blogging about what you cook at home, it’s easy to overcomplicate food. Every dinner has to be the best. 30 minute meals? Save ’em for Rachael Ray. 1 skillet suppers? I’m not about to sacrifice flavor for a couple fewer dishes at the end of the night. Chicken and rice for dinner? Sounds boring, like what I give my dog when he’s sick. But easy can be delicious and simple flavors can be supremely satisfying. And if both of those are true, washing just 1 pan after dinner is the icing on the cake. Thankfully, that’s the case with this recipe. It’s something I tried it on a whim. I had a bit of a tummy ache and wanted something soothing. Plus, I was feeling a tad lazy so I decided to just toss everything in my cast-iron skillet, throw it in the oven, and call it a day. To my surprise, it was way good. The rice turned into risotto, without me standing by its side, stirring. The chicken was moist and tender, with crispy skin. Score! Lemons, scallions, and garlic livened things up and a dusting of Parmesan sealed the deal; this was good enough to make again a couple of days later to share with you. Grab your skillet, preheat the oven, and let’s get ready to cook. Chop a couple of cloves of garlic, trim the tops and bottoms from a bunch of scallions, and slice a lemon. Pat the chicken dry and season it up. Sear the chicken, skin-side down, until it is golden and crispy. Flip and brown the other side of the meat. Remove the chicken from the pan and set it aside while we build the risotto. Sauté sliced garlic and scallions. Add Arborio rice and toast for a minute. Splash in a glass of white wine and let the rice soak it up. Nestle the chicken back into the pan, skin-side up. 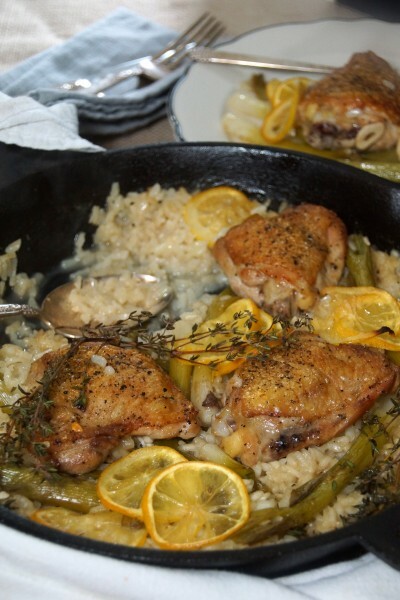 Cover the rice with hot chicken stock, tuck in lemon slices and few sprigs of thyme or rosemary, and pop it in the oven. Your work is done. Half an hour later, you’re looking at a tasty, low-stress dinner, and, for once, a sink that isn’t overflowing with dirty dishes. I think I could get used to this. Simple dishes like this are so homey and satisfying. Feel free to play around with it, adding more vegetables, different herbs, etc. Pat the chicken thighs dry with a paper towel and season with salt and pepper. Heat about a Tbsp. of olive oil in an iron-skillet or any oven-safe skillet and sear the chicken, skin-side down until golden and crisp, about 6 minutes. Flip and brown on the reverse side, about 2 minutes. Remove from pan, place on a plate, and set to the side. Drain off most of the chicken fat from the pan, leaving just a thin coating. Add the garlic and scallions and sauté until the garlic is golden and fragrant, about 2 minutes. Add the rice, season, and toast for about a minute. Pour in the wine and simmer until the rice has absorbed most of it. Return the chicken to the pan, skin-side up, along with any accumulated juices. Tuck the slices of lemon around the chicken along with a few sprigs of thyme. Add chicken stock to cover the rice. Most of the chicken should be submerged, with the exception of the skin. Transfer to the oven and bake until the rice is tender and creamy and the chicken is cooked through, about 30 minutes. Remove the thyme stems. Grate a bit of Parmesan over the finished dish and serve. I will be making this sometime this week (you know how I dislike washing a lot of pans!) And, I must say that thanks to you I hardly ever buy “boneless, skinless chicken breasts” any more which makes your father extremely happy! I think boneless, skinless chicken breasts are to blame for why I previously thought I didn’t like chicken. Hope you and Dad like it! Boneless, skinless breasts are basically “chicken with all the chicken removed.” They have their purpose (chicken strips, chicken salad) but for the real deal: thighs rule the roost! Thanks, Joni, I love hearing when people try my recipes! I’m glad you and your daughter enjoyed it. Do you think you could add 2 more (or even 4 more) chicken thighs? Would you need to scale up the other ingredients by the same amount? Would it fit, ya think? You could add as many chicken thighs as your pan will hold. I would add more lemon slices and scallions but, depending on your pan, the same amount of liquids might be fine. Really you just want to make sure the rice is completely submerged and the bottom halves of the chicken thighs are submerged. Good luck and hope you like it! I cooked this last night for the boyfriend and we ABSOLUTELY LOVE IT! Everything came out perfect and delicious. We were both sopping up our plates. The boyfriend said he could eat that every night. LOL. This was delish! Made a few changes based on what I had on hand – subbed shallots for scallions, and fresh oregano for the thyme. This is going on the short list for easy & tasty dinners! This sounds wonderful and I am anxious to try it. Hubby is not a dark meat chicken fan, so I will substitute breasts for the thighs or use a combination of the two. Hope it turns out as well as yours looks! I will let you know and rate once I attempt it. This is one of the best chicken recipes I have ever made! I made this a few months ago and it got me hooked on your blog. 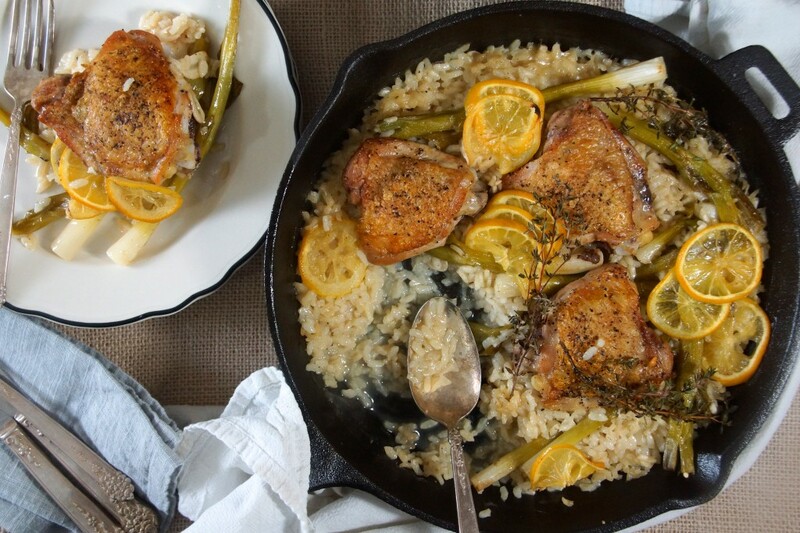 Risotto in a skillet? Brilliant! I just linked a friend because I was thinking back on it fondly. Now I have a plan for Monday dinner. Seems crazy, but it works out so well! Mairi, I’m so glad you liked it! I’ll never stop making risotto the “real” way either, but this method is nice to have in your back pocket when you’re short on time. Should I bake it covered or uncovered? This looks really good! I’m trying it tomorrow! Bake it uncovered so the chicken skin will stay nice and crisp. Hope you enjoy it! This was super easy and delicious. I had already defrosted 3 skinless chicken breasts, so I pounded them out, cut each one in half, and just followed the directions as is. It made a lot, so we had left overs that were great reheated….this is a keeper! Glad it worked out and thanks for sharing your variation! Planning on making this tonight..but I have bonless skinless thighs…still uncoverd you think? I think you could go either way since they’re skinless. Thanks for this yummy recipe. Made it tonight with chicken leg quarters, sliced baby portobellas and i diced the green onions. It was awesome. My husband said it was a definite keeper. 🙂 looking forward to making it again! . I made this once before and it was delicious and I had planned on making it again tonight but all the ingredients but I forgot the Arborio rice. Is it possible to use brown rice or will it not turn out at all? Made this yesterday – it was ok – if I make it again I’d cut the onions in 1/2, too stringy. I’d add 1/4 Cup of lemon juice (replacing some of the chicken stock). Add lemon zest and omit the lemon slices it made it bitter!